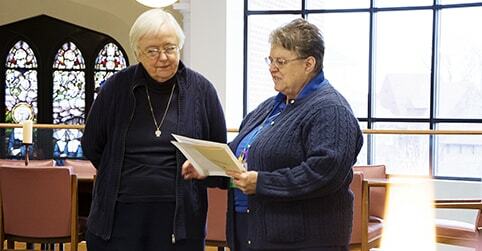 The Daughters of Charity live together in community, sharing prayer life, working together, and supporting one another to fulfill our common mission. Each community is made up of a house of Sisters who live among those they serve. This allows us to understand the daily realities in our neighborhoods, adapt and respond to changing needs, and make immediate impact. 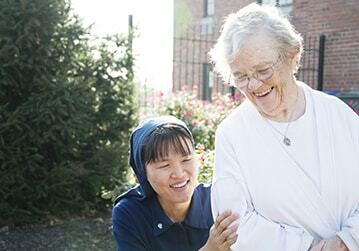 Daughters of Charity are passionate, active, and joyful women with varied interests and diverse backgrounds. Sisters collaborate on service projects, bringing new and innovative solutions to important problems. Even when working in different ministries, Sisters come together daily to pray, recreate, and share household responsibilities. The life of a Sister can be challenging, but friendship, support, and a strong faith bind us together and bring joy and laughter to our lives. Our life in community nurtures our spirit and strengthens our relationship with God, giving us the support and inspiration to carry out our mission every day.